Leonard Bingham Jr. of Lima confers with his attorney, Kenneth Rexford, during a hearing in Allen County Common Pleas Court on Tuesday. Rexford has filed a motion seeking to have evidence obtained in the drug case against Bingham ruled inadmissible at trial. LIMA — The attorney for a 51-year-old Lima man facing a bevy of felony drug and firearm charges, including the designation as a major drug offender, attempted on Tuesday to convince a judge that some evidence collected in the case should be ruled inadmissible. Leonard Bingham Jr. was indicted by an Allen County grand jury in May of 2016 on charges of possession of cocaine, a first-degree felony; illegal manufacture of drugs, a second-degree felony with a specification labeling Bingham as a major drug offender; possessing weapons while under disability, a third-degree felony; and possession of marijuana, a felony of the fifth-degree. The wheels of justice have moved slowly since that time as attorneys battle over several aspects of an alleged drug buy on the part of a confidential informant on March 31, 2016, and a SWAT team raid the following day at a residence in the 400 block of South Collett Street in Lima. Bingham was one of three persons to take the witness stand during a motion to suppress hearing before Allen County Common Pleas Court Judge Jeffrey Reed. Bingham said he did not sell marijuana to the informant as was alleged in an affidavit used to secure a search warrant that was executed the following day at the South Collett Street home. Also testifying was Arthur Petty testified that he sold a small amount of marijuana — and some Viagra — to Joel Pea on the night in question. Defense attorney Kenneth Rexford on Tuesday argued that the language contained in the affidavit used to secure that search warrant for the Collett Street home was “an acknowledged falsity” after prosecutors admitted the application for the warrant erroneously specified Bingham as the one who sold drugs to the informant. He also asked the judge to rule that statements made by his client to police on April 1 and May 17 should be ruled inadmissible at trial. Assistant Prosecuting Attorney Jana Emerick argued that the fact that a drug buy was conducted by the police informant at the Collett Street address was enough to justify the search warrant “and that probable cause exists” in asking the judge to dismiss the motion to suppress. 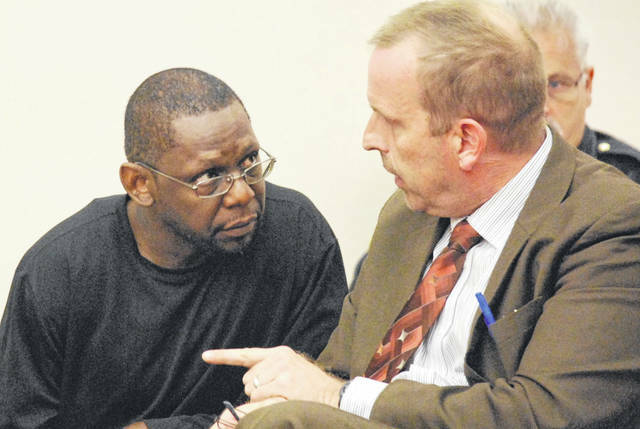 https://www.limaohio.com/wp-content/uploads/sites/54/2018/08/web1_Leonard-Bingham-Jr.jpgLeonard Bingham Jr. of Lima confers with his attorney, Kenneth Rexford, during a hearing in Allen County Common Pleas Court on Tuesday. Rexford has filed a motion seeking to have evidence obtained in the drug case against Bingham ruled inadmissible at trial.